With the phasing out of game, serial and parallel ports from modern computers and the ever increasing popularity of USB, it makes sense that hobbyists start getting to grips working with USB. Unfortunately, USB is not a simple protocol and can be daunting to implement. Luckily, there are several solutions on the market that can make implementing a USB device much easier. This project focuses on the use of a USB PIC and the mikroC compiler to convert an old game port joystick to utilize USB. One of the advantages of the mikroC compiler are the built USB HID libraries that make creating a USB HID device a doddle. When writing USB code using the mikroC compiler, the USB device produced is a generic HID device that can be used to transfer data to and from the PIC. However, it is possible to modify the USB descriptor generated by mikroC so that it produces a specific USB HID device, like a keyboard, mouse, joystick or graphics tablet. This project uses the mikroC v8 compiler. However, the methods used will most probably be relevant to other compilers that can generate HID code. The 76H1571 is a 4-button joystick with a throttle and POV hat. What’s interesting to note is that you can’t use the throttle and POV hat at the same time – you can only use one or neither. 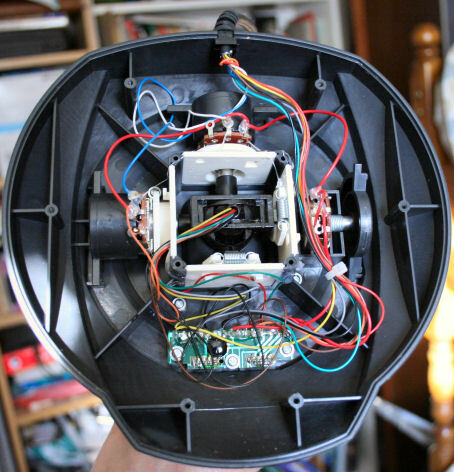 The two slide switches on the front of the joystick are used to switch the throttle and POV hat on and off, so that you could choose which one you wanted to use. 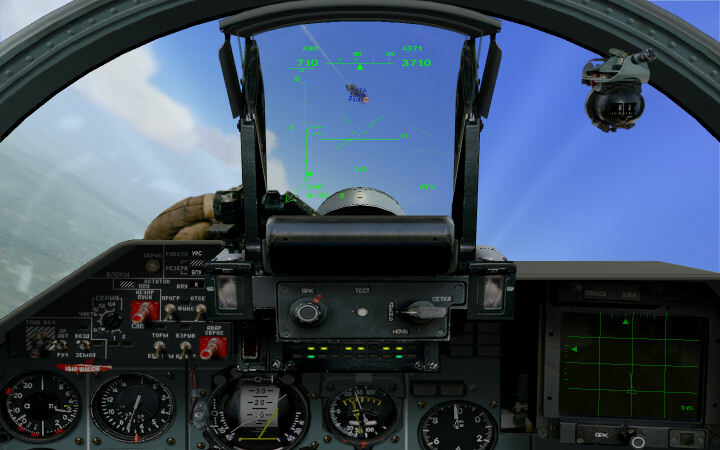 Because there is no point for this restriction with USB, the converted joystick will be able to use both the throttle and POV hat at the same time. This then makes the two switches at the front redundant, so why not add those as two extra buttons? When the compiler generates the USB HID code, it creates a descriptor that is sent to the USB host that tells it what type of USB device it is. A HID device descriptor is slightly different as it has an extra descriptor embedded in it that specifies the type of HID device and how it is used. It is this section that will be modified to change our device into a joystick. 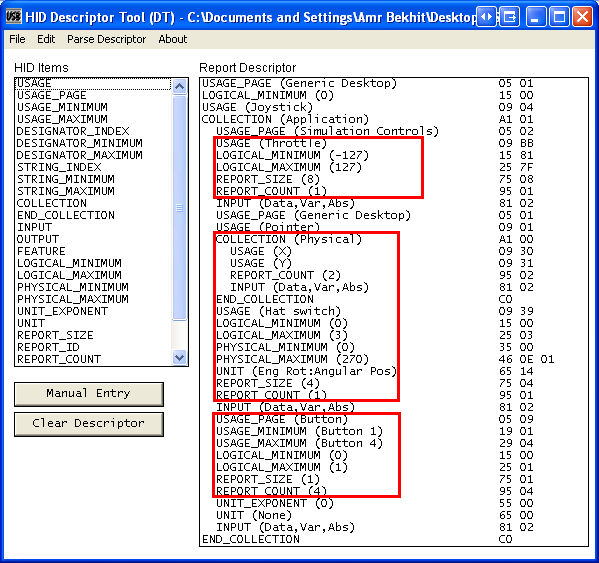 The USB IF website contains a useful tool that greatly facilitates the creation of HID report descriptors. It’s called the HID Descriptor Tool and can be downloaded for free from the HID Tools page. Once downloaded, extract the archive and run Dt.exe. You’ll notice that the REPORT_SIZE property defines the width of the data used to represent the parameter and the REPORT_COUNT property determines how many reports are sent to represent the parameter. 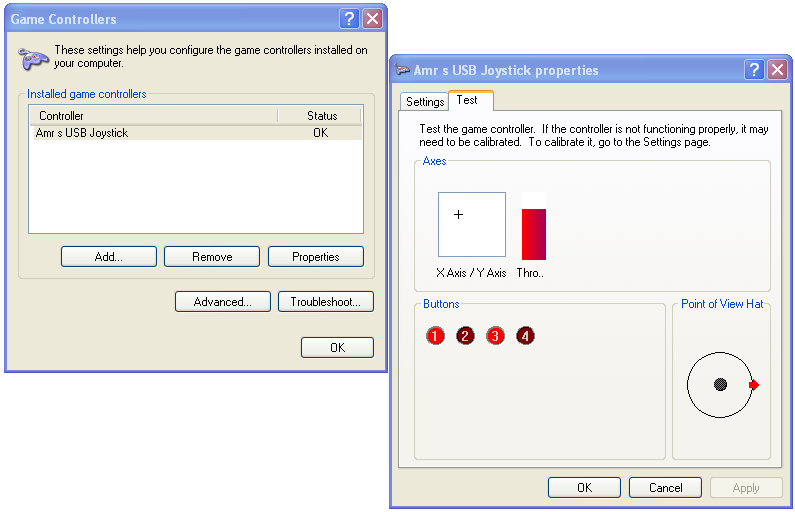 Have a look at Modifying the Joystick HID Descriptor to see how. With your report descriptor created you need to export it into C code. To do that, click on File->Save As in the HID Descriptor Tool. 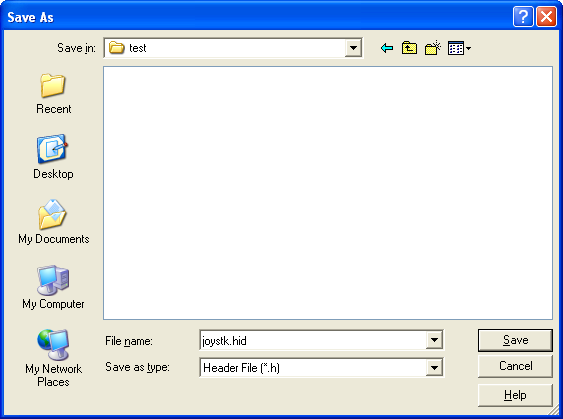 In the Save dialog that appears, change the file type to Header File (*.h). This will create a C header file that you can then add into your project. Now that the descriptor has been padded, the next step is to delete the report descriptor generated by mikroC and replace it with your one. To do that, first create the mikroC descriptor using the mikroC HID tool, then open it up in the editor. And that’s it. The descriptor should now be correctly mofied to behave as a USB joystick. The easiest way to test this out is to compile the code on to a PIC, plug it into a USB port on your PC and make sure that it is recognized correctly by the PC. Then, go to Control Panel and open up the Game Controllers options dialog. You should be able to see your joystick listed. With the data format determined, it is a simple matter to write some firmware that interfaces with the some buttons and potentiometers and sends the data to the PC, to confirm that the firmware is working correctly. 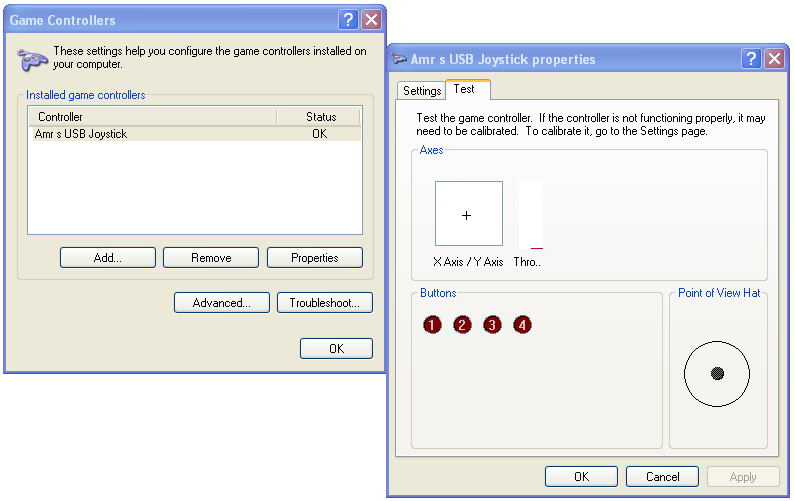 The behaviour of the PIC joystick can be examined using the Game Controllers options dialog in Control Panel. And that’s it! Put everything back together again and plug the joystick into a free USB port. 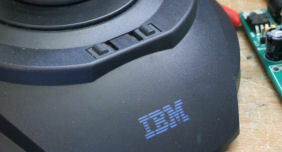 With luck, the joystick will be correctly recognized by Windows. You can then calibrate it and start using it to play games that support a joystick. This project kills two birds with one stone. 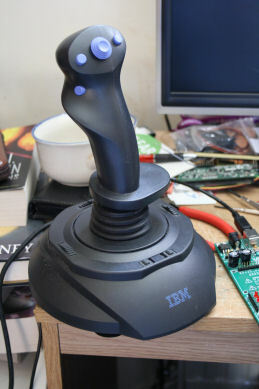 On one hand, the project shows you how to create a USB HID Joystick device and convert your old joystick into a modern one or even create your own joystick. On the other hand, if you know how to create the firmware for a USB joystick, the steps to create the firmware for any other HID device are very similar and the only difference will be in creating the HID report descriptor and how you send the data to the PC. You can download the project files here, including the source code and schematics. I doubt that you could program a Microchip device using a PSoC programmer. You could still build this project using a PSoC if you find some USB HID sample code: the changes to the descriptor will be very similar. Sir i am to submit project very soon so please reply. i am using mikroc and 18f4550 so what are these files for do they need to be changed in my case. Definit.h and Vars.h can be found in the Examples directory in your MikroC installation folder. They contain various definitions that the HID Library needs to work. Just copy them to your project folder. You don’t need to edit them. What did you want to say by “unpadded size of the report descriptor”? The unpadded size is the number of bytes in the descriptor without the extra 0’s that you need to add in mikroC. Great guide though, I’ve had one of these sitting around forever! The X’s on the stripboard layout indicate where you should break the tracks. 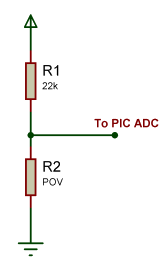 Regarding a larger circuit diagram, if you click on the image of the schematic you will be taken to a full size version. If that’s not big enough then please get in touch via the Contact page and I’ll send you a larger version. how do I modify the unsigned char const ProductDescr? I already had changed the name, but it was necessary to change the product id to show the new name. I used the mikroC’s tool to create the name. with but it doesnt work. i am new to this. 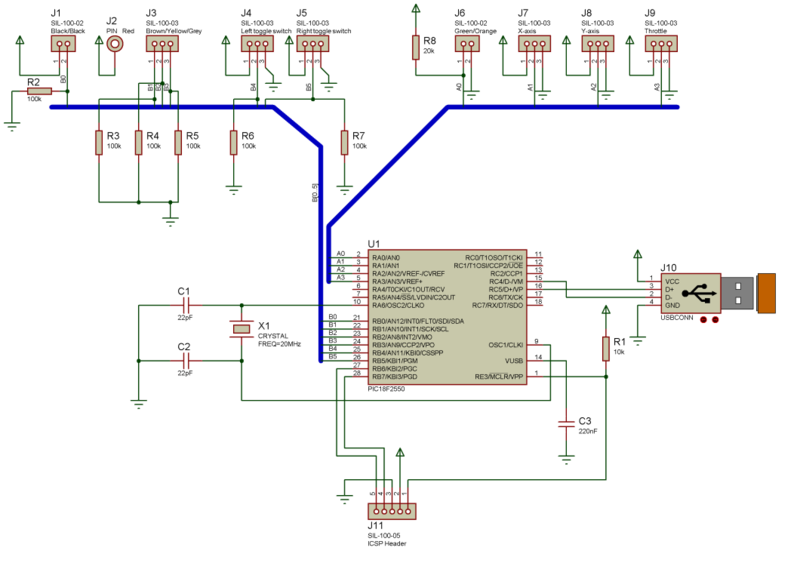 The problem is that i don’t understand to change the hid description in mikroC and the connection between the program usbdsc and joystick part. The joystick part is done. Whe I “build” in MikroC Pro I get numerous error!? Why is this please? Sorry it appears my quote did not post properly? OK… That problem was solved. But now when I press a button nothing is actually happening!? I guess the wrong (or none at all) data is getting transmitted?? Gonna have to do some more research, unless anyone has pointers please?? It sounds like you haven’t enabled the USB library for your project. You can do so from the library manager. oh! Now I understood, i have compiled the program without erros! soo…. another problem…. the potenciometer…. you gave a table with the values of resistence… but, the nominal value is??? sorry for the english mistakes…. i am a student of english…. I presume you’re talking about the resistances of the POV hat. The nominal position is called “Neutral” in the table. thanks, but i trying to know the values of the potenciometers that are in J8, J9…. Ah I see. 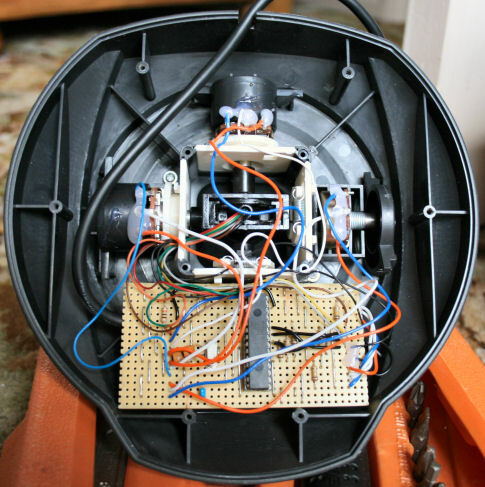 Those potentiometers were the ones for the X, Y and throttle axes already fitted in the joystick. I didn’t measure what their resistances were, but that doesn’t really matter, as I’m just interested in the voltage on their wipers. I’m sure most potentiometers you can find will work just fine. Hi! Now I am having some problems with the code, some errors appear when I build the project… I want to modify something in your project… that are working perfectly… but only with your Hex file… not mine.. could you help me….? if you inform your e-mail… it would be easier..
I’d imagine that would be relatively simple to do. All you would need to do is read the accelerometer data for both the x and y axes and transmit those values in place of the joystick’s x and y values. I just trying to adapt Your code for Mikroc for PIC v.5.8.0 and got only hid device in my hardware, but instead of joystick. can You help me to resolve this problem? I modified the descriptor and I’m able to see the progress bar of the throttle and rudder in the joystck properties Windows, but have no reaction in the flight sim. Instead X and y works. What’s wrong? What I have to add again inot descriptor to see this 2 axis? I dont understand what to modify in the USBdsc.c file and when I build that c file I get an error, main function not defined although I included Definit.h and VARs.h in the project file. please help me??? 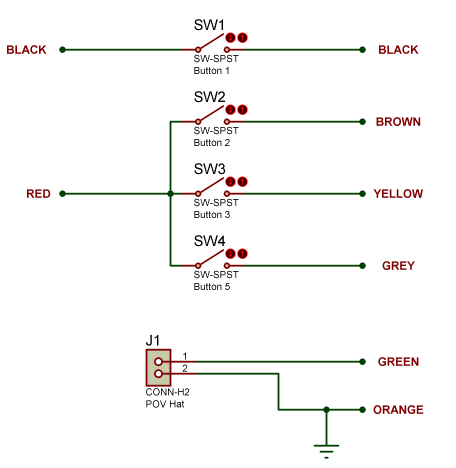 there is blue line in the schematic is the line connected with throttle and x,y axis midpoint or connected separately? I wrote HID descriptor for Joystick, the joystick has 8 axis. I want to know, is this right that Wheel and Dial usage for trim wheel and flap axis. also how do I add 8 buttons into the below code I have many tried for buttons but failed?